Calculators are a handy tool to have around in just about every application. We often take them for granted today, but even when I was a kid they were still sort of expensive devices that you put thought into buying. 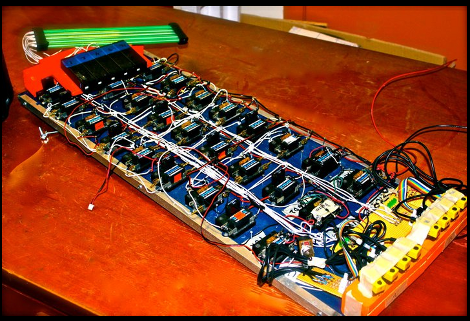 Illustrating just how far we have come is this awesome Relay Calculator brought to us by [Team 619]. Featuring an optical slider input system, the user can select any two 4 bit numbers and can add or subtract them. Logic is carried out by a couple handfuls of relays setup to be AND, OR, or XOR gates, which are then linked together to build adders. Output is in binary as well, in the form of lights, though we cant really tell if those are some form of tubes or if they are just rods lit on end. Either way if you require a lot of nibble math and want a conversation starter this suits the bill quite niceley. Otherwise you can keep hooking up more and more relays and maybe one day make your own relay computer. Join us after the break for a quick video! Those are CCFL tubes, FIRST includes them in their robot parts kits sometimes. By the looks of it most of the calculator is leftover FIRST parts, a great use of the junk in th lab! Looks like they’re using 12V CCFL tubes – the row of inverters is on the edge of the board. this is wonderful. props to team 619. Just don’t let a moth get in it.